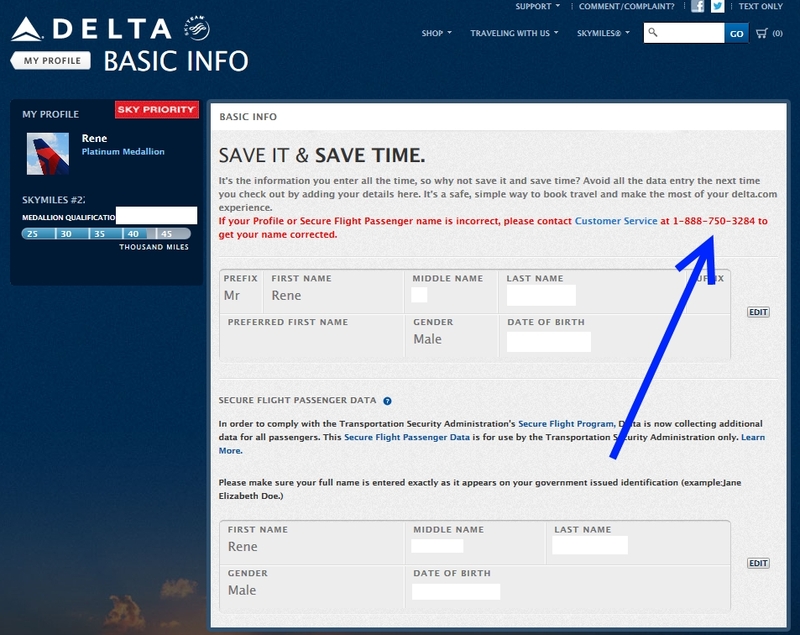 Secure Flight Passenger name data MUST match at Delta.com – time to check NOW! I had a post before about how to enter in your “Known Traveler” number you got as part of GOES that you can have rebated back when you get the Platinum Membership Rewards card ($100 good for 5 years) and also gets you TSA Pre as well. 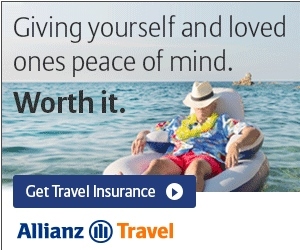 (not to mention $200 per year in incidental fees credited back to you and Skyclub access and other lounges as well). For a while now, if your Skymiles “name” did not match your Secure Flight Passenger name with Delta is was no big deal. That is now changing and you may be getting emails from Delta to align the two. This is being mandated by the government to Delta to have these two the same. So let’s say that you have ONLY your middle initial on your Skymiles account but full middle name on your passport, then you need to update. Now this must be fixed and you should first try calling Delta online support to do this at 888-750-3284. But for me, having a European name, I have a space in my last name. In the past Delta would NOT allow this and put my last name all as one word. But, on my passport, it has a space. If you find yourself in the same situation, you will have to FAX a copy of your passport to Delta to 404-715-9220. It would be a good idea to include your CORRECT name and Skymiles number on the page you are faxing to Delta as well. The other big issue is that you may have to have a bunch of your current reservations reissued. Be alert as you may or may not get correct Skymiles and MQM credit for them as well. Either way, NOW would be a good time to jump on this and make sure all is correct. ← Tonight’s Delta Points iGo winner is…. Just took care of this…when I went into my Skymiles profile, Delta prompted me to confirm either my “Skymiles name” or my “Secure Passenger Information name” because they were different. Thanks for the heads up! This also prevents services such as points.com from updating your balance, since your name no longer matches the version they have on file; changing it will cause it not to match any of the others. Further complications occur if, as in my case, the passport includes a suffix such as Jr and your driver’s license does not (due to a state snafu, the form for which has no “room” for it). So one or the other STILL will not “match” at the TSA checkpoint. Kafka’s The Castle in real life!! I am confused. When I log onto my Profile, it only has my first and last name displayed. When I look at the Secure Flight Passenger information, it has my first, middle and last name. I just called the number you specify and Delta said this is okay. @Sil – no. They should match. I would call back and make sure what you have on your passport is the same in both fields! Fax in if need be for them to fix. My secure data does match my passport information with the middle name. When I log onto Delta.com, I see only my first and last name. I just called again and CS said that is fine. Even my already bought ticket only has my first and last name and she said that is fine as long as it has been issued before Jan 17, 2013 which it has. I called twice and insisted to add my middle name and she said it doesn’t need to have it. How do I solve this? She does see my middle name on the secure data. @Sil – once you have the Secure data correct, then fax in a copy of your passport as described in the post. It will take a while and Delta will update so the two match and both match your passport. It’s not that simple. My drivers license has only my middle initial. My passport has my full middle name. I have nearly 100% success with precheck. So, what should get changed? @Bill G – what do you have on your passport. ?To me, that is the key. I have my TSA Pre info and GOES all the same as my passport. The next time I have my drivers license redone it also will match my passport. It’s funny……US carriers are insisting that names on tickets MUST match passports exactly. But non-US carriers such as LUFTHANSA and KLM say that the middle name is not required (as I find out recently when trying to change my current ticket).!! When I phoned in to add my middle name to the Secure Traveler information, the CSR (located in a nation far, far away) added the middle name in all upper-case. So it reads something like Miles JAMES Jones. I was logged in during the procedure and asked him to change upper-case JAMES to mixed-case James, but he refused to make the change. Evidently, this little issue cannot be fixed…another phone call to a different CSR wasn’t productive. That CSR would not even accept my second request, to change my first and last names to upper-case to match the middle name. A secure message to DL returned an irrelevant generic copy-pasted paragraph. In theory it shouldn’t matter whether the names are capitalized or not, but it will be interesting to see if I’m now addressed as James Jones rather than Miles Jones. @Miles – CAP on non-CAP should not matter. letters, dashes and spaces do from what I have been told. Not related. But sometimes I love delta. The flight was oversold. I volunteered my seat. Got the direct flight to atl I would have gotten and a $400 voucher. Good day for me on delta! I asked for first class. It was full. The best I could get was middle exit. Didnt think about food vouchers. It’s only a 30 min delay (and ill land earlier than original itenerary). @Steve – That works. Keep in mind, you could, if you have time, ask for another flight that DOES have 1st class space. May not get it but worth the ask if you have flexible time. OH, and if you don’t have access, a Skyclub pass is always nice too. Mental note for next time. This was a long week and I want to get home. Not sure I want to rock the boat though since PreCheck is about 100%. Wanna bet when I change everything to match I’ll never get chosen again? @Bill – at some point Delta will not let you buy new tickets until they match. @Steve f, you may be able to send Delta an e-mail after the fact and request ORC (original routing credit) and still get the extra MQM’s and extra segment. I have done this during IROPS, but I’m not sure if it will work in a VDB scenario. Couldn’t hurt to try! thanks for the suggestion Nick E.
I just fired them an email asking for the 700 or so extra MQM. @ Nick E. (and thank you too Rene!) – They approved my ORC request. Ended up being an extra 849 MQM and 1061 skymiles! Not bad considering I paid $225 for the ticket (ended up with $400 credit and the mileage from the original itenerary). And my co-workers made fun of me for doing ATL-MSP-DFW-DTW-ATL, rather than ATL-DFW-ATL for $20 more/ticket! In SFPD my first name and middle name is put together… Rang the CSR to change it but after they say its done it still remains incorrect. Should I worry? @Darragh – No. Should be fine. Happens to me too.